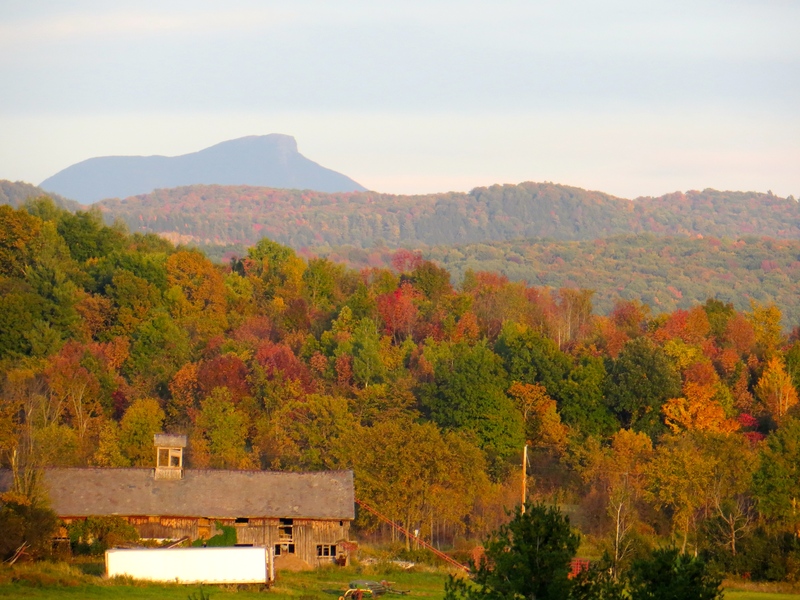 Here it is, the color wash on the hillsides, the collective visual shouting of millions of leaves. That shouting will get even louder in the next week or two. Talk around here has come back around to whether or not we have reached peak foliage. I hear the Northeast Kingdom is peak right now. The Eye on the Sky said it was peak on the summits. I don’t think it’s peak here yet; I give it two weeks yet. I love the noun “peak” to describe the brightest, most resplendent moment of the turning of the autumn leaves. The thing to do is to be on a peak at peak to take a peek at the brilliance from where the view is broad. Stunning it is on these last days of September, with weather to allow us to see it all. Personally I am guessing maybe ten days until peak. I haven’t been wrong yet this year. This morning after I saw the kids onto the school bus, I wandered back to the house. I worked at home today and I knew I would have a lot to do. I did not have many hours to accomplish all I needed to accomplish. So I wandered back to the house. Our driveway is about a quarter mile long so wandering is easy anyway. I took to the field, however, looking and listening, taking my time to attend to the duties I have accepted to make a living. I saw five bluebirds land in a tree, with two chipping sparrows accompanying them. I heard a Canada goose honk in the distance and I wondered if it was alone. I stooped to look at the purple asters, some light purple, some dark purple. I looked under the milkweed for monarch butterfly caterpillars and watched the chaotic flight of one of those orange and black beauties. The sun came out today for a few minutes this morning, but mostly it was just plain old cloudy. A few ducks flew off, blue wings flashing in the morning’s dimness. A breeze pushed the grass around in waves. I thought of the meadowlarks, so recently singing across this same field. I thought of seeing a crowd of them last October, late migrators stopping by our meadow. No meadowlarks sang today. But for the few cars passing and a handful of crickets, it was quiet. I got back to the house too soon, of course. I would have been happy to lie down and to watch the clouds, to look for spiders in the goldenrod, to smell the dampness, to watch the ash trees flutter their fading leaves. Reluctantly, I pushed open the door and got to work. I was not too distracted by the glory of the day so I did mange to get things done. I met my obligations, indeed, but I would have preferred to have shunned them today. I feel that way often these days. I want to soak up the world while I can. I don’t want to miss the butterfly that stops to sip at the last touch-me-not. I don’t want to miss the squirrel squirreling acorns. Each day passes and I miss most of it. We all do. We complain when the days are cloudy, but the cloudy days are as full of wonder as the sunny days. I have to choose to pay attention if I want to see it. I have to choose to be a part of the world, rather than to just watch. I have to choose to wander. Yesterday was a stunner. Clouds skimming the horizon in the golden light of fall. A warm breeze. Warm but not hot, cool but not cold. The day smelled of grass going to seed and leaves in the corners and apples. So we went to pick some of those apples. 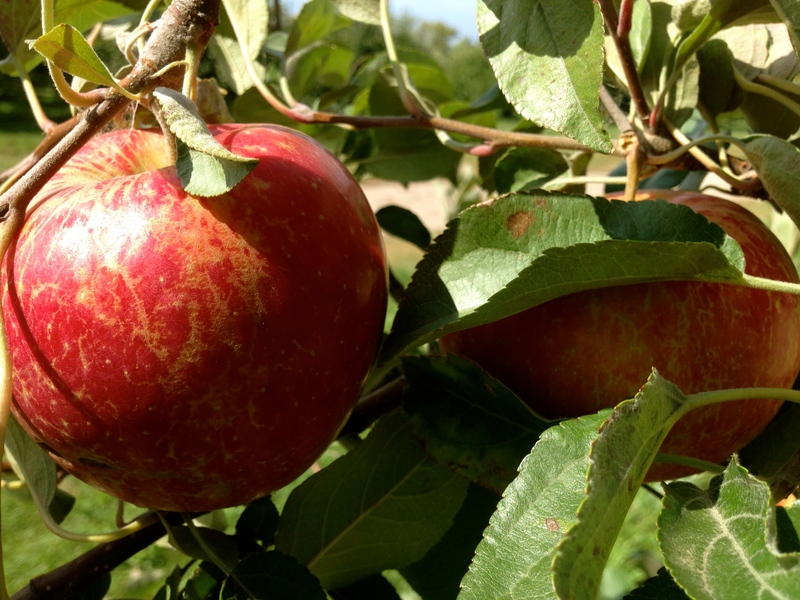 Shelburne Orchards is the spot of choice to pick apples around here. It sits above Lake Champlain so picking apples means walking the rows of fruit trees with a stellar view. We, my daughter and a friend of hers and I, arrived early in the afternoon. The place was as busy as yellow jackets in a cider bucket. Kids, college students, families, older couples. Everybody in the county was represented. And they were all smiling and having a good time in the orchard. We picked Cortland and MacIntosh. The picking was pretty good but finding the ripe ones was a challenge at times given the crowds that had been through. They have lots of trees, however, so we filled a bag and walked back through the orchard to pay. Of course, they don’t just sell apples, but apple and Vermont products of all sorts–cider (pasteurized and unpasteurized), pies, pre-picked apples (those all look pretty much perfect), maple syrup, and so on. We left the register with half a dozen cider donuts and some cold cider settled on top of our bag of fruit. We were not ready to leave just yet, however. The girls were hoping for caramel apples but that was a no go–they were not on offer. Instead, we got in line at the Betty Bar. There they served up Betty Cones–waffle cones with vanilla ice cream and warm apple betty layered inside. That was surely the treat to start off autumn. We left with full bellies and enough apples to eat straight up, to cook into jam, and maybe even to make a pie. There will be apples to pick for a while yet. One pie won’t be enough so I will have to head back, maybe in October for some different varieties. At this point I will even dare to wish for another perfect day. All of a sudden we don’t hang out on the porch all the time. It has gotten cold. Friday morning we had our first frost since spring started. Today the wind is howling. Fall has arrived. The crescent moon on the equinox makes it official. 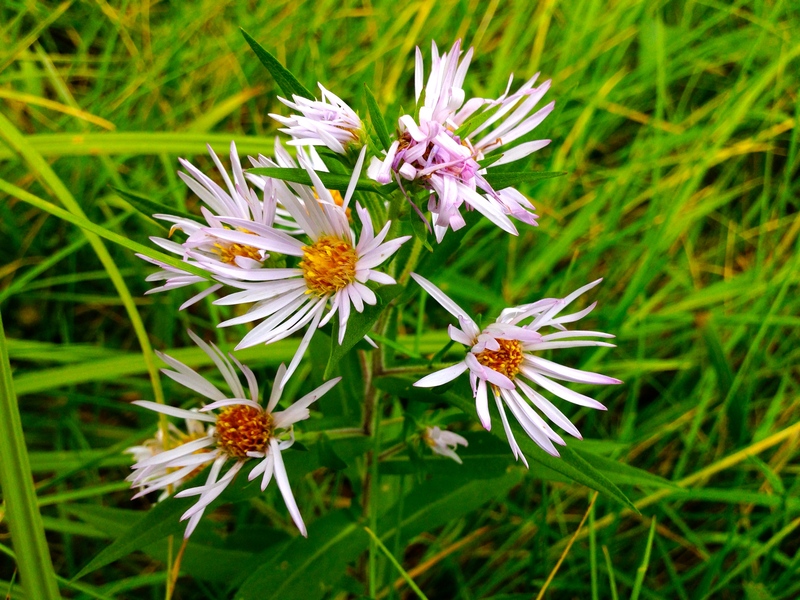 Asters are blooming in the field. Goldenrod bows in the wind. Milkweed pods are beginning to brown, their seeds drifting over the meadow. This morning I watched the Green Mountains silhouetted by the golden light of morning; a duck zipped across the sky, heading north. Birds have stopped singing, calling to each other now quietly to stay in flocks as they migrate. Leaves drift to the ground, red highlighting the hillsides. This time of year I think of all the things I have not done. I need to finish clearing the garage of painting accoutrements. I need to dig up and mulch the garden. I want to pick apples and make jam. I should prune some trees. And other things. Should I cut the field again before it snows? Can I fix the lawn mower so we can mow a few more times? Will we be able to get corn again before harvest season is over? It is hard not to want to simply get outside on these days the sun rises later and lower in the sky. There are mountains to hike and trails to run. Too many years ago my wife and I started hiking the Long Trail about this time. We got married in the fall. It is the best time of year to be outside. It is cool, beyond the heat of summer but not yet the chill of winter. There are no mosquitoes. The air smells full of all that was summer–fallen leaves and soil and ripe fruit. This morning I spent some time on the porch, finishing a book, drinking coffee, eating a cider donut I picked up at yesterday’s Shelburne Farms Harvest Festival. The wind whipped the trees and the field grass. I thought about all I might do today but felt lazy at the same time. Yesterday I read that the reason we are here is to lead an amazing life. Maybe I should start with trying to do that. 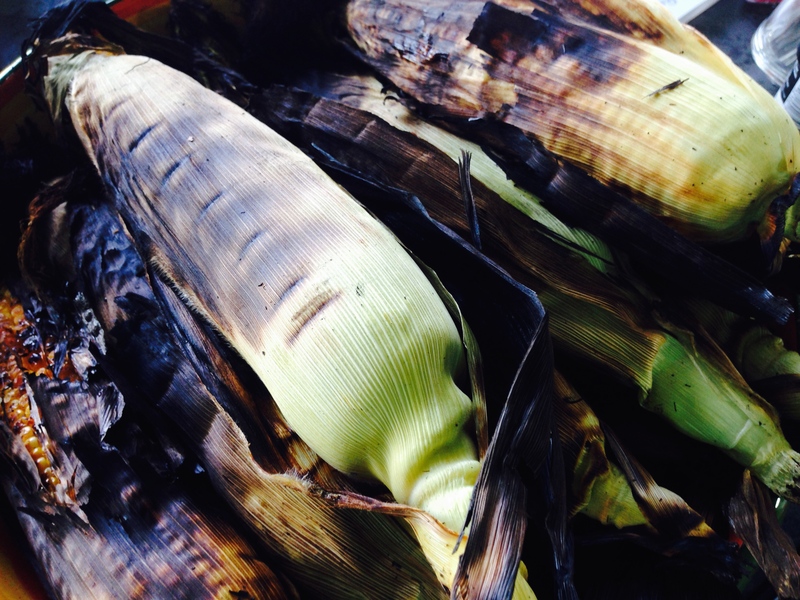 I am assuming an amazing life includes roast corn for dinner, if I can find it.